Your customers have a lot to say about your product or service. One option to understand their experience is to spend hours collecting the raw usage data. A better option is to solicit your customers responses, asking for their feedback. 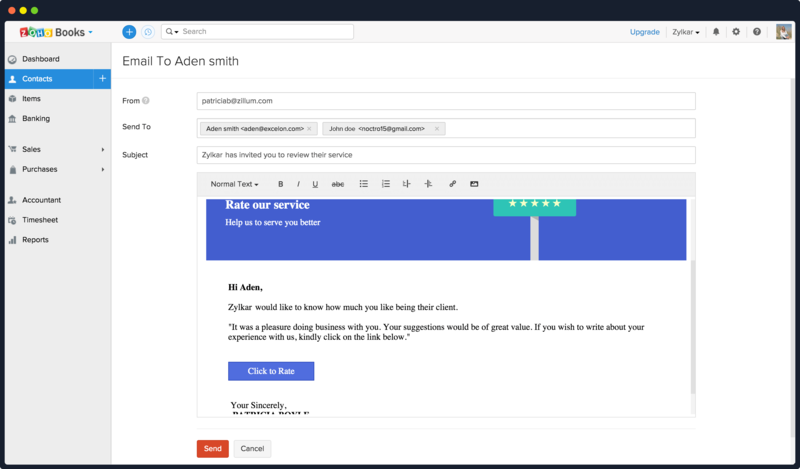 With customer reviews, our newest feature in the Client Portal, we at Zoho Books and Zoho Invoice have made it easy to hear from your customers directly so you find out where you can improve. 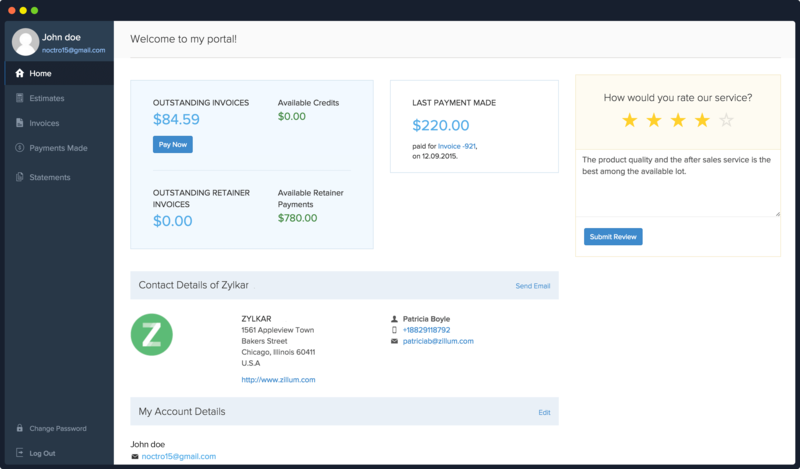 The portal lets you capture customer feedback within your Zoho account, saving you a few extra dollars usually spent on complex tools. You decide who to send a request for feedback and when to send it. Customers can be your best critics. They can help you uncover technical glitches, suggest missing features, or even point out what could be better about your pricing. Listening to them lets you chart out a strategy to bring about incremental improvements. Nobody likes being told that their product or service is lacking in certain areas. Nevertheless, you can’t ignore what your customers are saying. Customer reviews let you determine whether your business meets or surpasses their expectations. If issues remain unaddressed, customers may vent their anger in public. Soliciting their feedback gives you the opportunity to address a dissatisfied customer and perhaps deflate their anger. According to Nielsen, 92 percent of customers believe in the word of mouth over all other forms of advertising. As Brian Sutter puts it in his Entrepreneur article, “One negative review can cripple a business.” On the flip side, in terms of promoting your business, a positive review goes a long way: It could get you more traffic and subsequent conversions. Sharing your positive reviews is a great way to boost your social presence on the web.The reviews captured through the Client Portal can be shared on your website or on social media platform like Twitter. It’s a plus when a customer gives you praise. A positive review gives your team confidence that your business is on the right track and peace of mind that another customer is happy. To get started, here is a step-by-step guide that lays out how to configure your Zoho Books account to collect feedback with the Client Portal. 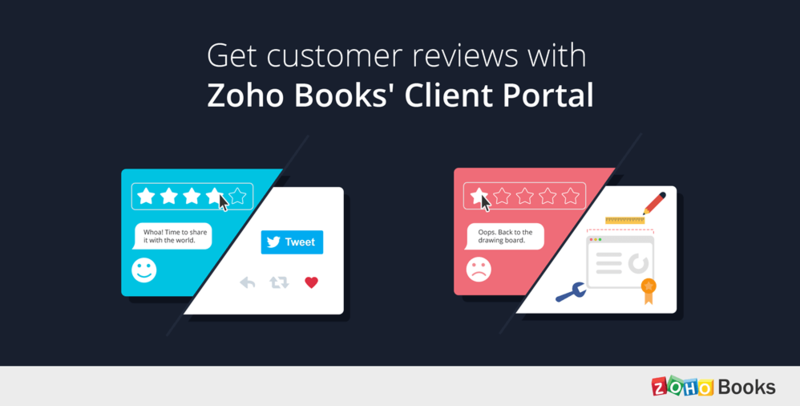 Step 1: Enable customer reviews within your Zoho Books Account. Click the gear icon at the top right corner, and check Enable customer review for my services under the Preferences tab. Step 2: Grant portal access to the customer. 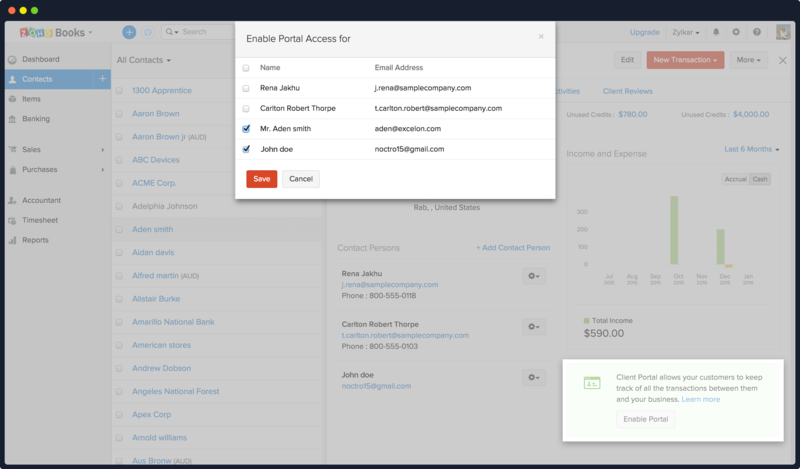 Head to the Contacts tab and enable portal access for your customer by clicking the Enable Portal button in the bottom right corner. Step 3: Request a review. Go ahead and click Request for Review in the bottom corner. 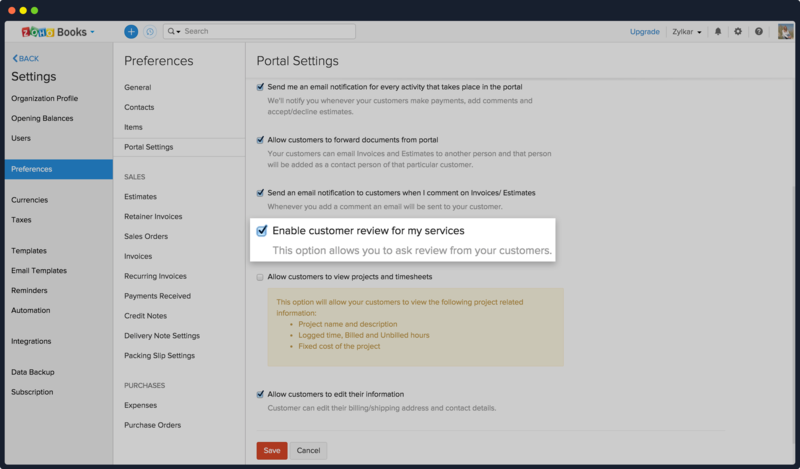 In case you skipped Step 1 of the guide, upon clicking Request for Review, you will receive a pop-up to enable customer review settings. Click Yes. Step 4: Send a customized email with personal branding. 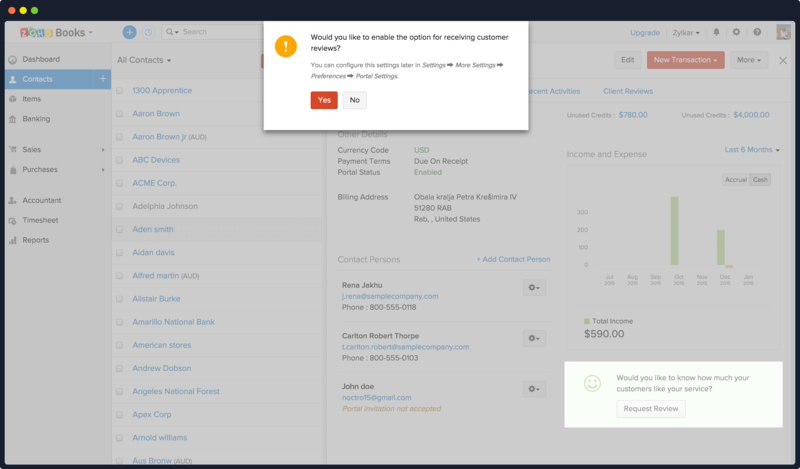 The next screen shows an interface of an email addressed to your customer. It contains the logo of your organization and a link to the Client Portal. Add a personalized message and hit send. Step 5: Collect their feedback. Your customer will then receive an email to rate your service. When they click the link in the email, the customer will be directed to the Client Portal. Here, they can rate and review your service, and they can enter their comments in the space provided. Step 6: Share their feedback. Once a review gets submitted, you will receive a notification within your Zoho Books account. These reviews are also stored under Client Reviews for a specific customer under the Contacts tab. Share the feedback you just received on social media platform like Twitter and celebrate with a glass of your favorite champagne. Note: The steps illustrated above remains the same for Zoho Invoice. 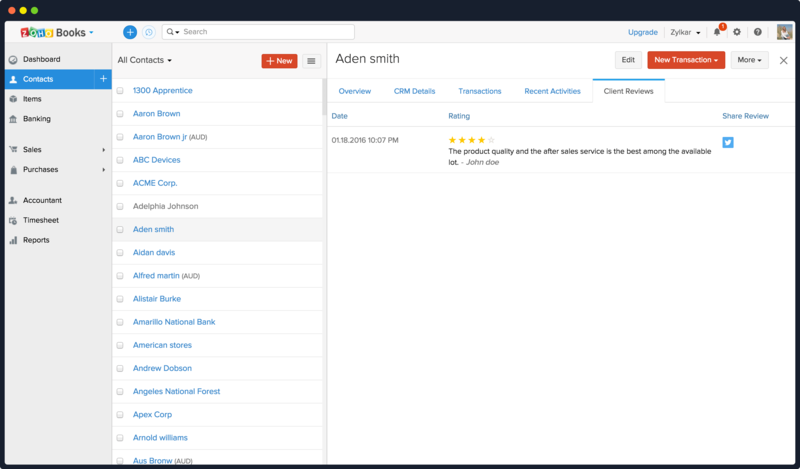 Customer review is just one of the many exciting features of our Client Portal. The portal also allows businesses to Share, Discuss, and Get Paid Fast. Business owners can share invoices, and customers can accept estimates and update their personal information online. In addition, businesses can be more efficient in their communications by bidding adieu to lengthy emails threads. Try out this feature and get the feedback that could improve your business. Want to chat about it? Leave a comment below, or send us an email with your thoughts to support@zohobooks.com.